To be eligible for student loans (especially private loans) a cosigner with a longer and more established credit history is required. Sometimes it makes sense to have a relative as a cosigner. Sallie Mae is one of the largest providers of horrible debt slavery student loans and often requires a cosigner on their loans, as high school students usually do not have a credit score or credit history. I started with over $36,000 of Sallie Mae (rebranded as “Navient” as of October 2014) student loans in 2010 and have slowly worked it down to $29,000 in January 2013 (I'm focusing my debt avalanche on paying down my higher interest rate USAA cadet loan right now). 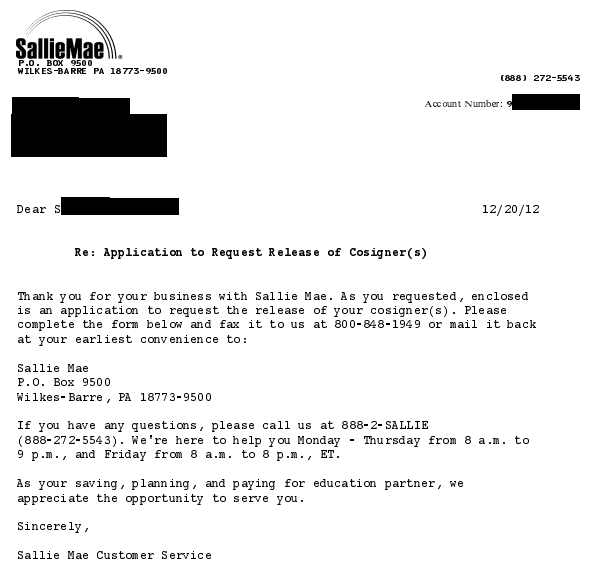 After 24 months of on time payments to my Sallie Mae student loan, I'm ready to remove my dad as a cosigner. Removing a cosigner from a student loan or any loan mostly benefits the cosigner, not the person who needed the cosigner in the first place. By having their name removed from the student loan, the cosigner will probably see an increase in their credit score, due to their total amount of debt decreasing. This could make it easier for them to be approved for a mortgage, credit card, or any other product that requires a good credit score. To qualify for cosigner release, the borrower must have successfully completed school, made 12 consecutive on-time principal and interest payments for Sallie Mae's Smart Option Student Loan® (24 consecutive on-time principal and interest payments are required for all other Sallie Mae private student loan programs), meet age of majority requirements, and meet the underwriting requirements when the request for cosigner release is processed. The borrower's account must remain current until the request for the cosigner release is processed. The borrower must be a U.S. citizen or permanent resident at the time the cosigner release is processed. Translated, this means you have to make 12 months of payments if you have the Smart Option Student Loan or 24 months of payments if you have any other Sallie Mae private loan. For my loans, Signature Student Loans, the requirement was 24 months. The “age of majority” line means you have to be a legal adult. As for the underwriting requirements, what was explained to me when I called was that I had to have a solid credit history, with no 19 day or more delinquencies on my Sallie Mae loan payments. Call that number: 888-2SALLIE and fight your way through the phone tree (I found that just pressing “0” a few times connected me to an operator fast). Tell the operator that you would like to have your cosigner released from your loans. They will review your account and then email the cosigner release form to your email on file. Sallie Mae wants to know that you can afford to pay off your debts on your own. To do this, they require that you submit proof of income, which can be a recent pay stub or a W2 (which is handy if you're self-employed). If you're in the military, you can go to myPay and print your most recent LES easily. 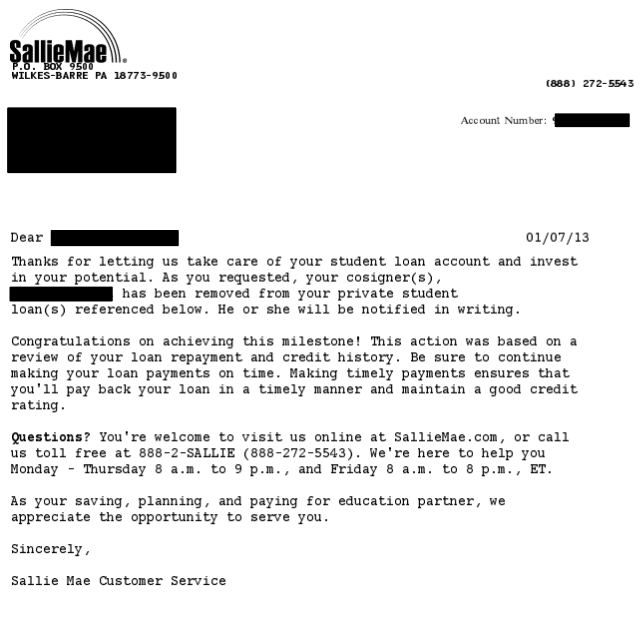 It took about 24 hours for Sallie Mae to email me the notification that the release request was in my Sallie Mae documents. My total time was 18 days, but the Christmas and New Years holidays fell in there. 6. Success! Cosigner is released! After 60 days or so, check the cosigner's credit report over at AnnualCreditReport.com to ensure that Sallie Mae has in fact removed the loan from their report. If they haven't, time to follow up with Sallie Mae and see what the hold up is. So in seven easy steps (and a bit of patience) you can return the favor to your student loan cosigner by removing them from your loans. Have you removed your student loan cosigner? Run into any trouble having your application to release them approved? Will you still get funds from sallie mae to your school if your cosigner cancels but you as an individual doesn’t have a credit score ? I have been trying to release the cosigner off my Sallie Mae/Navient student loans and SM keeps denying it. 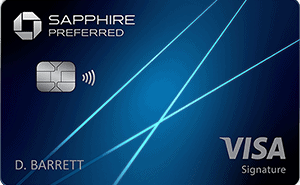 I have excellent credit and have high income. However, SM continues to deny removing my cosigner. Does anyone know what the Debt to Income Ratio Sallie Mae or Navient requires to remove my cosigner. I asked Sallie Mae what is the debt to ratio needed or they require to to remove cosigner and they have not answered any of my emails or phone calls. When you call them, they say to email them at the email [email protected] but they don’t respond to any of my emails!!! I have seeked out to an attorney and he stated they’re in violation if they do not respond or ignore my emails. Does anyone know what the debt to income ratio is needed to remove the cosigner??!! How did you get your cosigner removed? 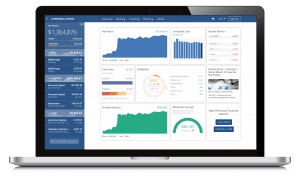 I realize this is an older post, but I wonder if you could answer a question– did removing your co-signer have an affect on your interest rates? It did not affect my interest rates…they remained exactly the same as they were before the cosigner was removed. I have been trying to have my name removed as a cosigner for 3 years now. My ex-husand has made every payment on time except there was a late paymet within the first two years of the loan so Sallie Mae will not release me as a cosigner and they informed me that becauase of the type of loan I cosigned for I can not be removed as a cosigner. I had a copy of the promissory note sent to me and no where on there does it state I cannot be removed. It is pretty ridiculous if you ask me. waiting for the results….in the same boat. My daughter owes Sallie Mae $75,000. She graduated in 2006 and has made continuous on-time payments for 6 1/2 years so far. We’ve applied several times to have us removed as the coborrowers but Sallie mae denies us every time. The reason is very vague. The loans were sold to us with a very high praise on “removal of the cosigner” deal after 24 months of on time payments. This is a a load of crap. Sallie Mae has no intention of removing us as cosigners. We are of retirement age and likely cannot retire with this loan hanging over our heads, especially with such a high balance and fluctuating interest rates. Can anyone suggest any way of getting us off this loan? Or does anyone have experience with attorneys who are successful with this problem? 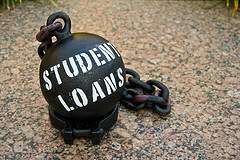 As a former financial aid director of a college, student loan debt always troubled me. It makes sense to get your name off as a cosigner and it will improve your credit score. I paid off my student loans years ago and was very happy when that last payment was made! David – congratulations on getting your loans paid off! I really think we need student loan reform in this country, similar to the way New Zealand does it: everyone is eligible, interest free (as long as you stay in the country), income based repayments, and it’s all handled at low administrative cost and online.